Academic Suspension can occur when a student violates the terms of their academic probation (e.g., failing a course or not meeting an average as outlined by your program) and can also result as a sanction from Academic Integrity based decisions. The Registrar’s website has detailed information about Academic Status including Probation, Suspension and Debarment. Students facing suspension can also explore the alternative BOOST Program. 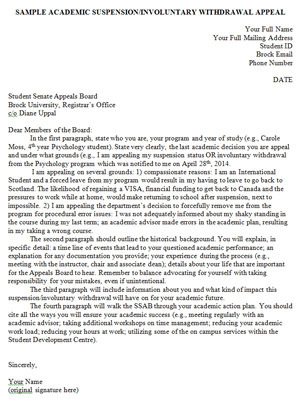 The Undergraduate Calendar outlines the procedure for appealing an academic suspension. The Registrar’s Office also offers tips and a sample appeal letter for students to follow. Speak with an academic advisor to fully understand why you were placed on academic suspension. Work with an advisor to create a game plan to return to school after the BOOST program, or after you have fulfilled your suspension, or after a successful appeal. Read this guide from Academic Advising and Exploration Services about Probation and Suspension. What were the key reasons you have not been successful at Brock? Use your period of dismissal to reflect on and address the factors that led to your poor performance. Meet with an academic advisor. The Registrar’s Office has general academic advisors and each department has Faculty specific advisors who can guide you. Book your online advising appointment ASAP. Get registered as a student with a disability. Get documentation to provide to professors and TA’s. Consult Career Services to get career advice and use the Career Assessment Tool. Perform an in-depth review of programs through Brock’s Undergraduate or Graduate Calendar including course/program requirements, entry standards, and graduation requirements. Academic Advisors can help. Review your program guide by visiting your department’s website and searching for your program. Learn about the BOOST program as an alternative to academic suspension.